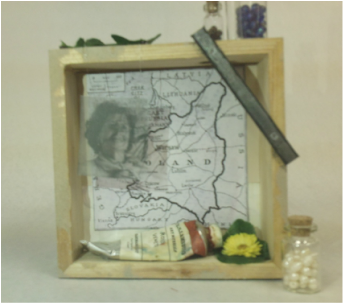 I wanted this shadow box to encompass growth rather than loss. Talking about the Holocaust is incredibly difficult for Hanka Kornfeld- Marder, so I didn’t want to make those aspects of her life too overbearing. The map of Poland is in the background because that is where Mrs. Kornfeld- Marder was born and lived during years leading up to the war. Laying in front of the map is a picture of her. I wanted her photograph to interact with the map. Throughout I have included leaves. They were often served as nourishment by the Nazis to prisoners, but after liberation leaves symbolized rebirth. There also jars of beads and a paint tube. After the war Mrs. Kornfeld- Marder became an artist, and through art she told her story and expressed her emotions. Hanka Kornfeld-Marder is a very creative and beautiful woman, an artist. She has two children and four grandchildren. She is very kind, gentle, and not at all negative or hostile. She is very generous and always helps others. Most people would never guess that Ms. Kornfeld- Marder was a Holocaust survivor. Survivor Hanka Kornfeld-Marder was born in Bedzin, Poland in 1928. After the war, she went to Israel and then to Santiago, Chile. She went to Chile because she had family there. Her children were born and raised there. She also developed a jewelry business called Hanka Lane, and she studied painting. Some of her work is displayed at the United States Holocaust Memorial Museum. In the 1970’s, her daughter, Raquel, moved to Boston to study physical therapy at Boston University. Her son was also in Boston studying at the Massachusetts Institute of Technology. Because family was important to her, Ms. Kornfeld-Marder moved to the Boston area to be close to her children. Now Ms. Kornfeld-Marder lives in Framingham, Massachusetts, and her children still live nearby. She loves to cook, and prepares a Shabbat dinner for her family every week. She still keeps in touch with friends in both Israel and South America. It is impossible for Ms. Kornfeld-Marder to speak about the Holocaust, but she puts all of her emotions and memories into her artwork. Recently, a museum opened in Poland commemorating the history of Jews. One of Ms. Kornfeld-Marder’s close friends asked her if she would want to go see it. She replied, “Absolutely not. I have no desire to go back to a place that was so cruel to me.” But even after experiencing so much pain, she has built a life for her and her family full of generosity, warmth, and g’milut hasadim (“lovingkindness”). She is a very positive person and feels lucky to have such a good life now.